To take control of the kitchen overseeing operations including menu planning, budgeting, safety regulations and HACCP along with a drive to help further our establishment as a destination cafe, with the creativity to work with the owner to deliver a menu that meets and exceeds the expectations of our customers. You will have previous experience of taking charge and being responsible for your work environment, you’ll need to be able to deliver consistently high standards working under pressure. We currently open daytime only so no split shifts or late nights, working 5 days from 7, and weekend work will be required. Hours approx.35hrs – 45hrs per week in summer. 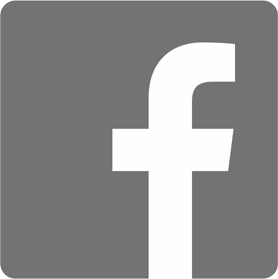 Pay £9 – £9.50 per hour and depends on experience, and will include an end of season bonus. 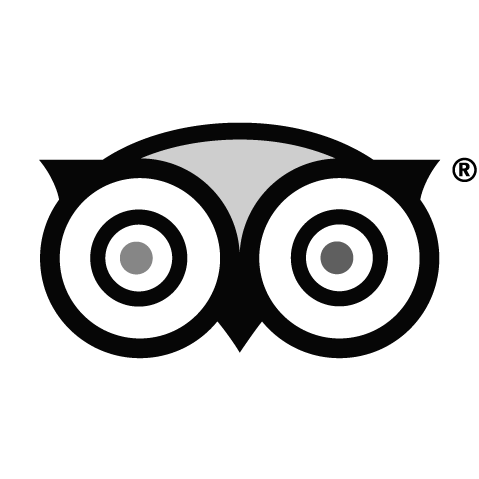 The West Shore Beach Cafe is a traditional beach cafe with the emphasis on delicious home cooked food, and excellent customer service. Now in our 14th year we are looking to build on our past success and are currently looking to expand the premises in 2020. If you are interested then please email your CV and covering letter to westshorebeachcafe@hotmail.co.uk tell us a bit about yourself and which role you are applying for. Approx. 35hrs – 45hrs per week, 5 days from 7am. We require a chef with baking skills to assist in the running of our busy kitchen working within a close-knit team. You will need to be able to produce consistently good standards while working under pressure. The job requires skills in all areas. This is a temporary contract to the end of October 2019. Shifts can include weekend work, but NO split shifts.Includes an end of season bonus. 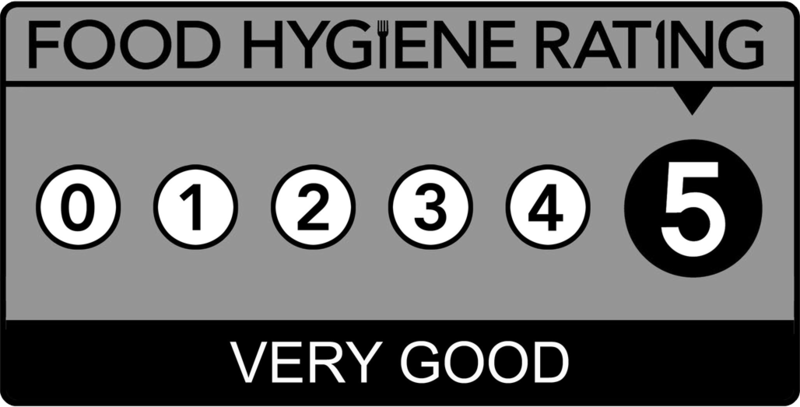 Experience in a similar role would be an advantage and a current Hygiene Certificate is preferred but not essential. 5 days per Week, includes weekends but no split shifts or late nights. We’re looking for somebody to join our friendly team who recognises what good customer service means and enjoys working in a busy cafe environment. You’ll need to have an eye for detail, be cool under pressure and be an active team player. The main duties Includes serving customers, making drinks, clearing tables, replenishing stock and assisting us in keeping the cafe clean and tidy. Previous experience and barista skills would be an advantage, although training will be given. Pay depends on experience, and will include an end of season bonus. Join us at the Llandudno Armed Forces Weekend for the Sunday Tea Dance. 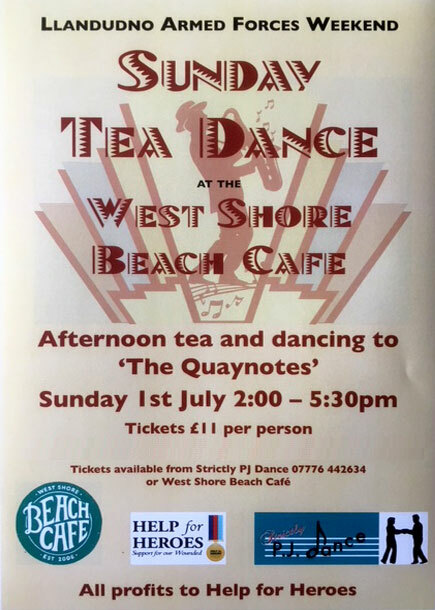 There will be afternoon tea and dancing to ‘The Quaynotes’. Tickets are £11 per person and the event is being held from 2.00pm to 5.30pm on Sunday 1st July 2018. All profits go to Help for Heroes. 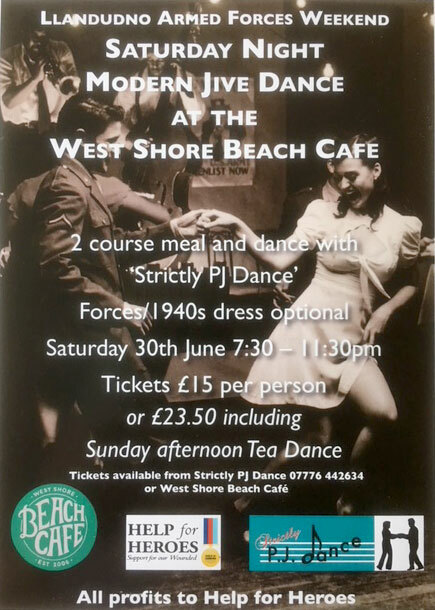 West Shore Beach Cafe is proud to annouce a Modern Jive Dance night at the cafe this June (2018). There is a two course meal included and Forces / 1940s dress is optional. All profits go to Help for Heroes. Tickets are £15 per person (or £23.50 including a Sunday Afternoon Tea Dance on Sunday 1st July 2018). Tickets are available from the DJ for the night, Strictly PJ Dance on 07776 442634 or from the cafe. Start time for Saturday Night Jive is 7.30pm on Saturday 30th June 2018. Receive a Certificate of Excellence and get a 10% discount for LIFE! 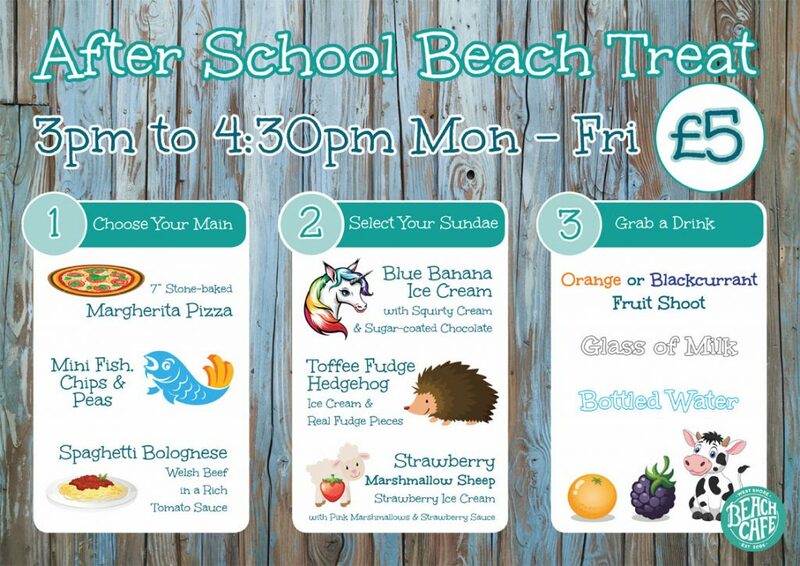 We will bring the ingredients for you to build your own ice cream sundae. 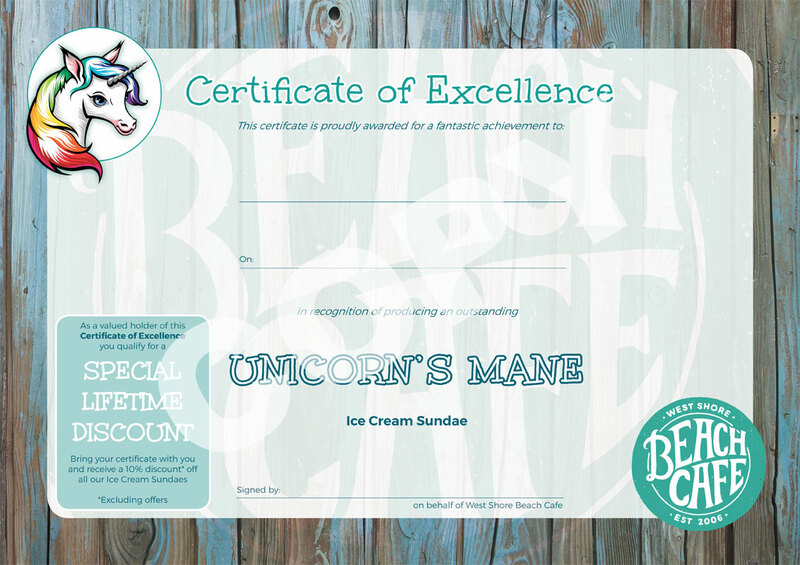 Once you eat your sundae we bring you the certificate which gives you 10% discount for life when you bring it to the cafe! Delicious! 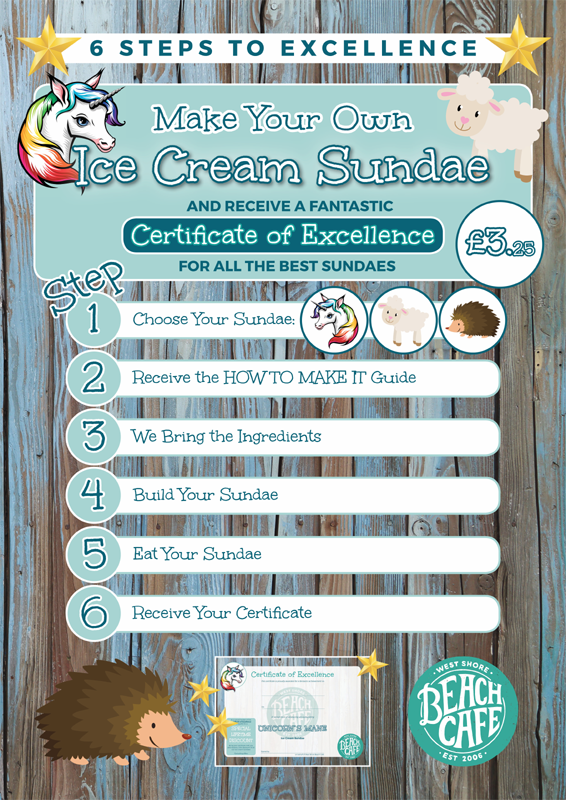 There are three sundaes to choose from: Unicorn’s Mane, Strawberry Marshmallow Sheep and Toffee Fudge Hedgehog. We’ll cook serve and even do the washing up – and the kids will be happy too. Throughout October and November we’ll be serving a special menu for just £5. It includes a meal, drink and fantastic Ice cream sundae.